This Blohm und Voss fighter design used an Argus As 413 (4000 HP) or Jumo 213 (1800 HP) buried in the fuselage just behind the cockpit. It was fed by an air intake located beneath the fuselage and the pusher propeller was driven by means of a long shaft. The wing was mounted at the bottom of the fuselage and had no sweep back or taper. The tail unit was of cruciform design and a tricycle undercarriage was fitted. 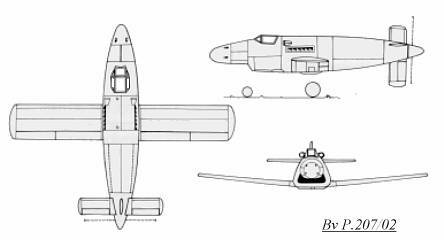 Proposed armament was two MK 103 30mm cannon and two MG 151/20 20mm cannon located in the nose.